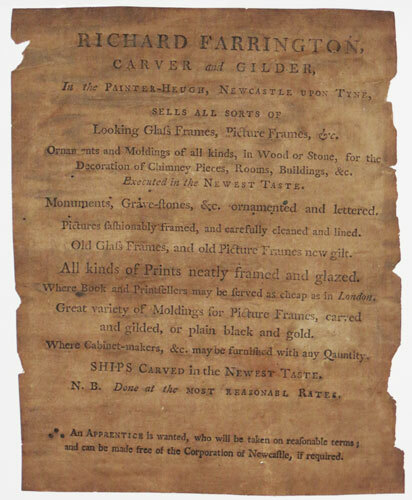 [Advert.] Capel House. The late Residence of Governor Boddam. To Be Sold, or Let, For a Term of Seven, Fourteen or Twenty-One Years. This Property Consists of a Large and Well-Arranged Family Mansion, Situated in the Centre of a Park & Pleasure Grounds, Containing Thirty-three Acres, Which are Diposed with Admirable Effect. Letterpress pamphlet. Sheet: 320 x 200mm (12½ x 8''). Creased and laid on album sheet. An advert for the sale of Capel House in Enfield. The large house was sold by the Boddams Family in 1840 and was bought by a tea planter named James Warren. 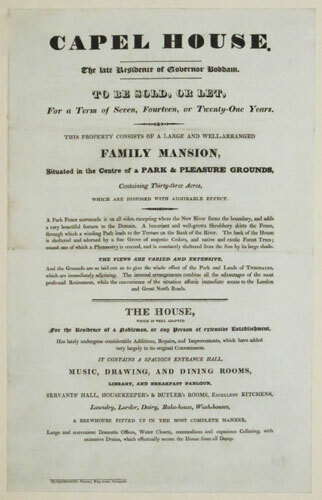 The pamphlet provides details of the house as well as a map of the grounds and a lithographed view of the house and grounds. [Change of Address.] R. Havell, Jun. Begs to Announce that he has removed from 179, Newman Street, to No.77, Oxford Street, Opposite the Pantheon. Letterpress. Sheet: 80 x 125mm (3 x 5''). A handbill informing the recipient of Robert Havell Junior's relocation. Havell moved to his new premises in 1831. Ode by Henry James Pye Esq. P. L. Performed at St. James's, January 18 1806 on the Anniversary of Her Majesty's Birth Day. [&] Lines, by H. Tresham, Esq. R.A. Which Were Embellished with an Elegant Portrait and Given in St. Paul's Cathedral at the Time of the Interment. Pub.d. Jan.y. 18 1806. by Edw.d Orme 59 Bond Street. Nichols, Printer, Earl's Court, Newport-street Soho. 2 letterpress sheets. Plate: 270 x 450mm (10½ x 17¾"). Central crease as issued, slight staining. Two poems published in 1806. The first is a poem by James Pye (1745-1813), published to celebrate the birthday of Queen Charlotte in 1806. James Pye, who had served as M.P. for Berkshire between 1784 and 1790, had supported Pitt the Younger and has been said that it was through this alliance that Pye was elected Poet Laureate in 1790, a post he held until his death in 1813. 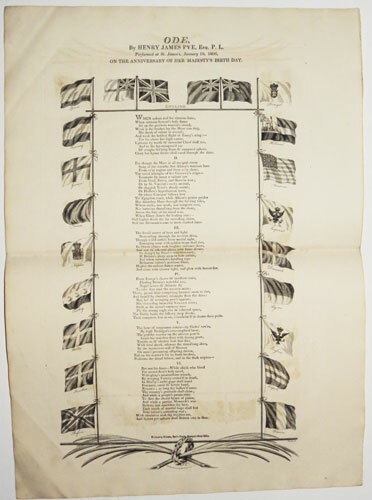 Each year on both the King and Queen's birthday Pye would publish a strongly patriotic ode in celebration. Surrounding the text, flags of various nations are illustrated including America with 13 stars. The second poem was written to commemorate the funeral of Lord Nelson in St Pauls. A plate from 'Orme's Graphic History of the Life, Exploits, and Death of Horatio Nelson', published only three days after the funeral. Two letterpress playbills; verso in ink "List of the Musee ..... when a part of Lord B! Mass was executed. Nov 1829" Largest sheet: 415 x 280mm (16¼ x 11''). Creases, foxed and tears. 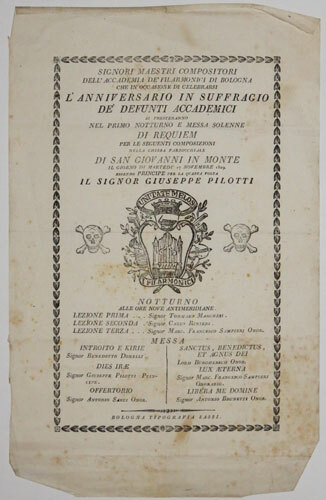 A pair of playbills listing the performances by the masters of Accademia Filarmonica di Bologna held in San Giovanni in Monte on 12th-13th and 17th November 1829. The playbills are engraved with decorative borders and the academy's moto 'Unitate Melos' in a crest with an organ. Rare hand-coloured woodcut. Sheet: 165 x 270mm (6½ x 10½''). Trimmed, some repaired tears. 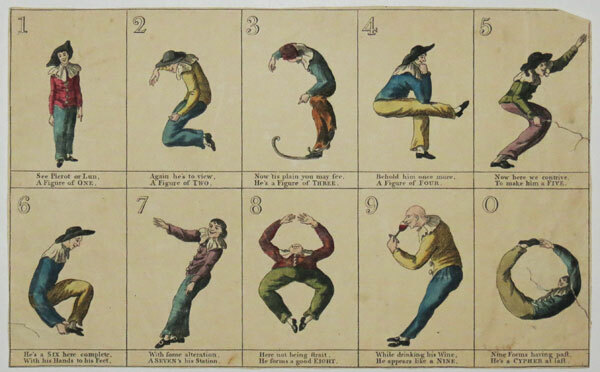 A series of vignettes showing numbers 0-9 formed by a pierot in various poses, childs education sheet. [Advert.] 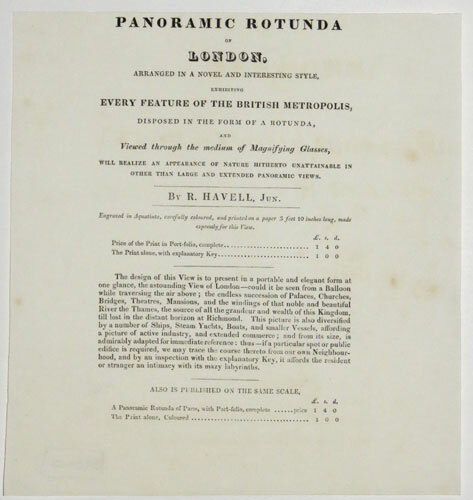 Panoramic Rotunda of London, Arranged in a Novel and Interesting Style, Exhibiting Every Feature of the British Metropolis, and Viewed through the medium of Magnifying Glasses, Will Realize an Appearance of Nature Hitherto Unattainable in Other Than Large and Extended Panoramic Views. Extremely rare letterpress. Sheet: 200 x 190mm (8 x 7½''). An advert for an aquatint panorama of London by Robert Havell Junior. [Advert.] Just Published, in Imperial Quarto. 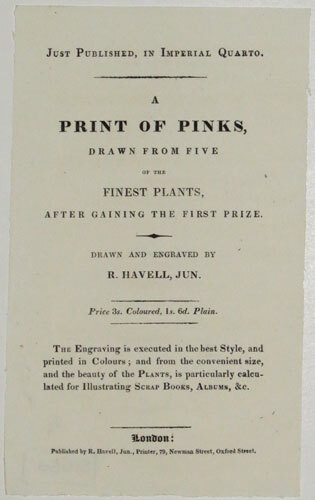 A Print of Pinks, Drawn from Five of the Finest Plants, After Gaining the First Prize. Drawn and Engraved by R. Havell, Jun. 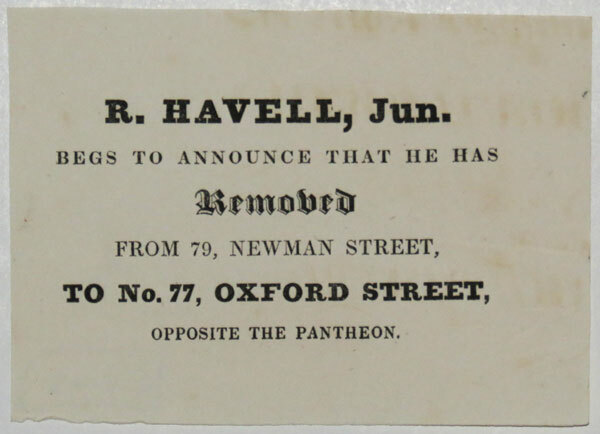 London: Published by R. Havell, Jun., Printer, 79, Newman Street, Oxford Street. Scarce letterpress: 180 x 110mm (7 x 4¼''). An advert for a series of botanical prints. [Advert.] 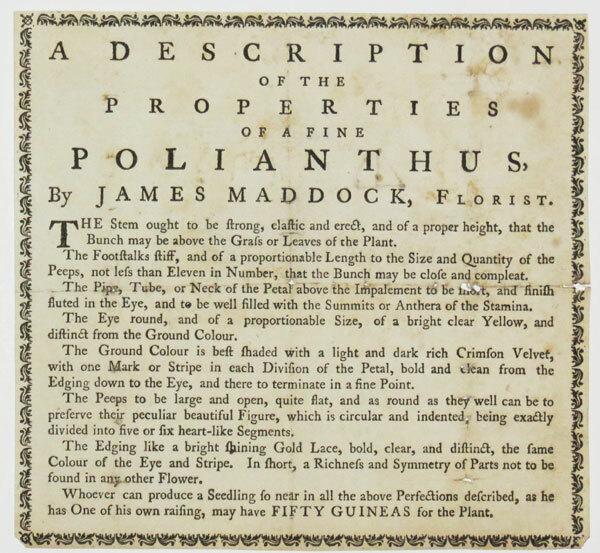 A Description of the Properties of a Fine Polianthus, By James Maddock, Florist. A rare & scarce letterpress advert. Sheet:135 x 145mm (5¼ x 5¾''). Trimmed, folds and damage. 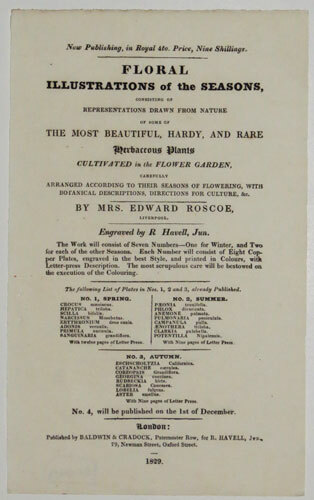 A pamphlet requesting a seedling of a polianthus with a promise of fifty guineas for the right plant. James Maddock, a London florist and author of 'The florist's directory; or, A treatise on the culture of flowers; to which is added a supplementary dissertation on soils, manures' 1792. 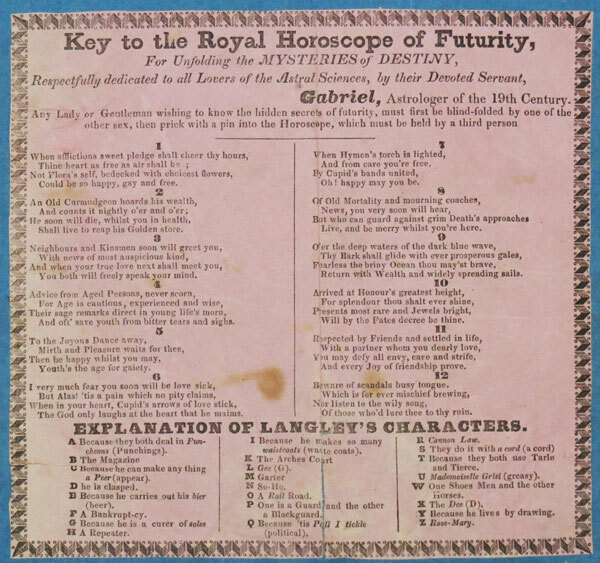 Key to the Royal Horoscope of Futurity, For Unfolding the Mysteries of Destiny, Respectfully dedicated to all Lovers of the Astral Sciences, by their Devoted Servant, Gabriel, Astrologer of the 19th Century. Letterpress. Sheet: 165 x 170mm (6½ x 6¾''). Creasing, trimmed and laid on album sheet. A horoscope, possibly produced by the Society of the Mercurii, one of the primary groups involved in the revival of the occult and astrological in the 1830s. By Mrs. Edward Roscoe, Liverpool. Engraved by R. Havell, Jun. Published by Baldwin & Cradock, Paternoster Row, for R. Havell, Jun. 79, Newman Street, Oxford Street. 1829. Rare letterpress. Sheet: 225 x 140mm (9 x 5½''). Binding holes. [Songsheet.] Dedicated to the Gallant Ill-Fated Crew of the ''Titanic''. Be British! Descriptive Song and Recitation. Written & Composed by Paul Pelham & Lawrence Wright featured by Mr. Geo. D'Albert. Songsheet: 360 x 255mm (14 x 10''). Edges bit tatty. 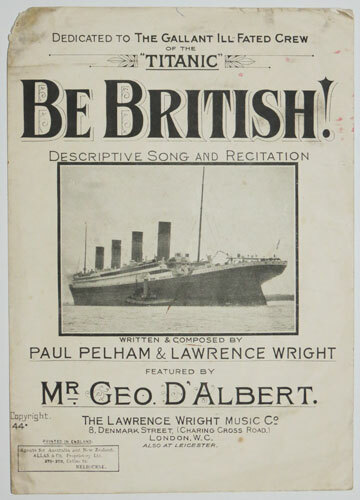 A songsheet for a patriotic song celebrating the crew of the Titanic. At bottom left "Agents for Australia & New Zealand, Allan & Co Proprietary Ltd. 276-278 Collins Street, Melbourne." Very rare letterpress. Sheet: 175 x 140mm (7 x 5½''). Paper tone. A frame label for a framer in Newcastle.